Grow your own donut shaped flat peaches right here at home - hard to find in the shops, but really tasty and worth growing. Incredibly sweet and juicy, imagine picking them fresh from your own tree each summer on a warm day - perfect! The variety 'Saturn' is one of the best tasting, with the added advantage of lovely pink spring blossom too. Fully hardy, self fertile and easy to grow in a sunny spot - either in large pots or against a south-facing wall, plants will eventually reach a height of 3m high x 2m wide. Supplied as a 1m tall tree in 5L pot, dormant in winter, so will have no leaves if supplied before spring. Donut or Flat Peaches are increasingly seen in the shops these days so you may have already sampled their incredible, sweet taste. Now you can grow your own and pick this delicious fruit within reach of your own back door. These trees are incredibly hardy and will easily withstand the harshest winter before bursting into beautiful deep pink blossom in spring. The unique flattened peach fruits are borne in small clusters and ripen in late summer. They're luscious eaten warm straight from the tree and because of their shape you'll find then much easier to munch than round peaches - children in particular just love them. These bare root trees are self fertile and perfect too for planting in patio pots - they are easier to care for grown like this. 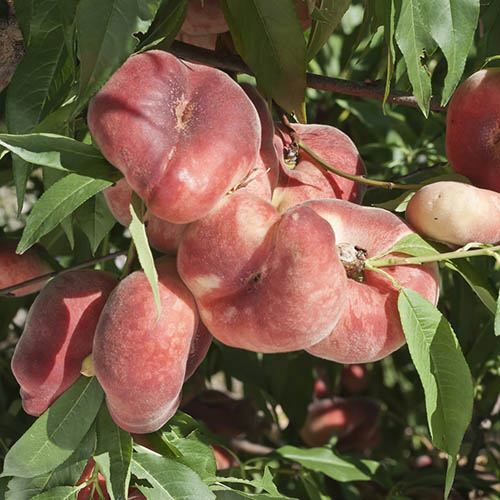 Like other peaches, 'Donuts' benefit from shelter from winter rains which can spread leaf curl disease and moving the pot to a greenhouse or lean to is much easier when potted. Supplied as a 1M tall ree in 5L pot to plant out all year round. Like other peaches, 'Donuts' benefit from shelter from winter rains which can spread leaf curl disease and moving the plant to a greenhouse or lean to is much easier when its potted! If planting outside, choose a sheltered, south-facing wall. Dig a hole twice the width of the roots, forking over the bottom to loosen the soil, then add some good quality fertiliser, compost or well-rotted manure. Plant at the same depth as the tree was in its pot. Holding the tree upright in position with one hand, slowly backfill the hole with soil, so the soil falls back around the roots. If you’re planting into pots, place some old rocks, stones or gravel in the bottom of the pot for ballast. Use the best compost you can buy and some sand or grit for drainage. Water container-grown trees almost every day during the growing season and give them a high-potash liquid feed every couple of weeks. Repot every couple of years, using John Innes No 3 compost. Water the plants at least weekly – especially in dry weather – for the first 8 weeks. Do not allow plants to dry out. Prune established trees in summer using good quality secateurs, removing weak shoots and overlapping branches, fruit appears almost entirely on shoots from the previous season, so pruning aims to replace fruited wood with new, young wood. Pruning fruit trees in summer after the fruit has set will encourage more fruit growth the following year. If you want to encourage your tree to grow, the best time to prune is autumn/winter.